Leading mental health charities have warned that almost a quarter of children with eating disorders seen by the Chesterfield Royal Hospital NHS Foundation Trust are waiting too long to begin their treatment. Charities like Beat and YoungMinds say a ‘postcode lottery’ is leaving many youngsters struggling to access the care they need, with ‘patchy’ services leading to ‘significant local and regional variation’ in waiting times. NHS guidance says that children should begin treatment within four weeks of referral, or within one week for urgent cases. At the Chesterfield Royal Hospital NHS Foundation Trust, only 77 per cent of children and under-19s referred for an eating disorder began their treatment within those timeframes in the 12 months to June, according to the latest NHS England data. The figures put the trust below the national average - across England 81 per cent of patients were seen within the target window - and represent a deterioration on the previous year, when the target was met in 80% of cases. This drop came despite Government efforts to drive down waiting times, with NHS trusts and other healthcare providers given a deadline of 2020 to ensure they are meeting their targets in at least 95 per cent of cases. But more than a quarter of providers that returned data for the past two years saw a similar drop in performance last year. Tom Quinn, director of external affairs at eating disorder charity Beat, said it was ‘difficult to be confident’ that the 2020 target will be met ‘given that so many trusts appear to be falling behind’. Mental health charity YoungMinds agreed, describing the target as ‘ambitious and unlikely to be achieved’. Overall, referrals are on the up in England, increasing from 5,725 between July 2016 and June 2017 to 7,054 the following year. 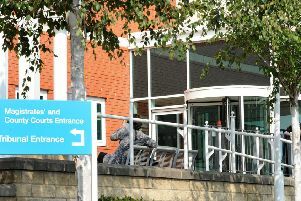 In the case of the Chesterfield Royal Hospital NHS Foundation Trust, however, cases fell from 54 to 39 over the same period. Waiting times varied significantly across England, with the number of cases in which targets were met ranging from 20% to almost 100% depending on the NHS trust. Mr Quinn continued: “We are concerned there is so much variation - early treatment is crucial, and some trusts are playing catchup. “The extra money the Government put forward hasn’t been ring-fenced and our analysis shows that not all Clinical Commissioning Groups (CCGs) are spending it on eating disorder services. Marc Bush, Director of Policy at YoungMinds, said: “It is encouraging to see an increase in the number of young people receiving treatment across the UK. “However quality and access to treatment still remains patchy. An NHS England spokesperson said: “More young people are getting the treatment they need for eating disorders, and there has been a significant improvement in treatment times for NHS care.